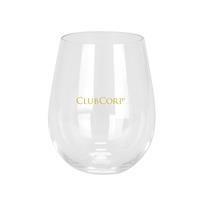 Check out our new line of wine tools! 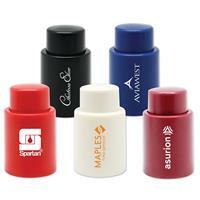 Our wine stoppers are great for wineries, restaurants, events and more. Available in red (S21158X) and blue (S21129X). One color and one location imprint only. 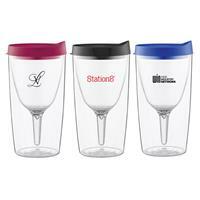 Check out our new line of wine tools! Our vacuum sealers are great for wineries, restaurants, events and more. Available in blue (S16280X) and black (S16281X). 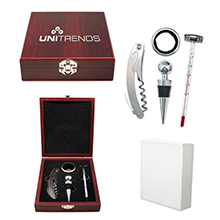 This elegant Wine Tool Kit is the perfect holiday gift for that special person and features 4 essential wine tools: 1 Wine Stopper, 1 Thermometer, 1 Bottle Collar and 1 Multi-Tool Opener. The wood case can be pad printed with your company name or logo so your brand will be visible for years to come. Packaged in secure, white box. Hand wash only. One location imprint only. Check out our new line of wine tools! 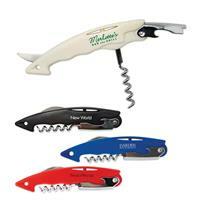 Our wine multi-tools are great for wineries, restaurants, events and more. Available in black (S21124X) and white (S21123X). One location imprint only. Check out our new line of wine tools! 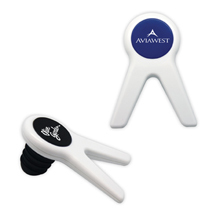 Our wine stoppers and pourer are great for wineries, restaurants, events and more. Pourer spout measures 7/8" diameter. 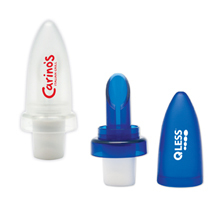 Available in translucent blue (S21132X) and translucent white (S21133X).